To access the Upper School's Afterschool Programs' weekly schedule for 2018/2019 please go to this link. Ramallah Friends School encourages students to take part in as wide a variety of extra curricular activities as possible usually after the end of the school day. This is an opportunity for students to develop new interests and learn new skills. This is part of the School's responsibility as a learning environment providing students with choices which they can make voluntarily and independently. The opportunities serve as an important role in the student’s future interests and career. The Yearbook Committee: Each year students, under the guidance of a faculty member, are responsible for producing a yearbook which chronicles the life of the school during that academic year. 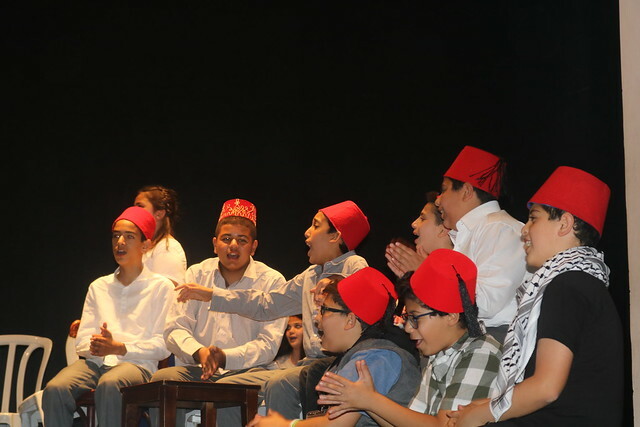 Drama Club: Each year a group of students, under the guidance of a faculty member, prepare and put on a major drama production, that includes theater, debkeh, modern dance, and stage design. Student Council: In the Fall semester class representatives and an administrative team are elected by the students. Working with a faculty advisor, the Student Council is responsible for organizing student activities. Sports: Each year the physical education department coaches basketball, handball, volleyball and soccer teams which compete against area schools. RFS also partners with the international organization Sports for Life to offer a wide range of sports activities outside of school for students and local Palestinian youth. Model United Nations (MUN): In hope to develop students' abilities in debate, discussion, and conflict resolution, MUN gives students interested in global affairs and international topics an opportunity to discuss these matters on a competitive level. An MUN committee consisting of students is elected before the winter break, and is responsible for organizing a Palestine MUN conference, a training summer camp, as well as arrange for our students to join MUN delegations abroad. Library Committee: Students have an integral part in helping the librarian run the library. This volunteer committee helps with shelving books, signing books in and out, and running the photocopier. Modern Dance Group: The Modern Dance Group is trained by a professional and performs in the city of Ramallah for a wide audience every year, and also participates in various school events. RFS' dancers choreograph their own production, and usually participate in the school's drama production. Traditional Debkeh Troupe: The Debkeh Troupe performs the Palestinian traditional folkloric dance during the academic year at various school events and is one of the oldest performance troupes at the RFS. School Trips: Field trips by classes or groups of students are encouraged. These trips, however, must be approved by the administration and chaperoned by school staff. Parents are notified about all school trips and must sign a permission slip allowing their child to take part in such an activity. CAS: Students in the IB program are required to complete 150 hours in creativity, activity and service projects.